Home > Questionnaires > Questionnaire: Is it Disability Discrimination? It it sad but true that discrimination and prejudice due to one's ability status does still exist. Often this discrimination is blatant, but sometimes those who are discriminated against can't even be sure of what exactly happened to them. To help you sort though instances of what may have been disability discrimination we have put together the questionnaire below. Answer each question, then total up your "yes" answers and match this number to the explanations at the end to determine if you have been the victim of disability discrimination. 1. Has an employer ever declined to provide reasonable adjustments in the workplace for you? 2. Have you ever been offered a job with certain terms and conditions tacked on because of a disability? 3. Have you ever not been sold or rented an accommodation because of a disability? 4. Have you ever felt that others make jokes at your expense due to a disability? 5. Has a landlord ever refused to make reasonable adjustments to a property for you? 6. Have you ever been refused a place on a course and believe it was due to a disability? 7. Have you ever been excluded from school due to a disability? 8. Have you ever attended a school which did not comply with a statement of your special education needs? 9. Have you ever felt that you were not promoted at work due to your disability? 10. Have you ever felt that you are given less favourable tasks at work in the hopes that you will quit? 11. 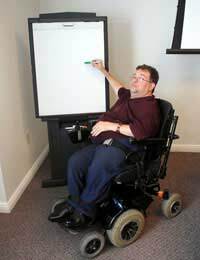 Have you ever felt that you were unfairly charged for a product or service due to your disability? If you answered "yes" to between one and four questions then you may have experienced disability discrimination. It may be that you have felt as though you were discriminated against due to a disability while others involved believed that they were acting reasonably. Indeed, "reasonable adjustments" depend on many factors so it can be hard to ever definitively prove if others have made enough of an effort to accommodate you. If, after reflection and research, you still feel that you were treated wrongly consider reporting the incident according to your employer or educational institute's grievance procedures and be ready to openly and honestly discuss what happened and how it affected you. Even if no final judgement can be made about a past situation you may still be able to communicate that you feel uncomfortable and what you would like to see change in the future. If you answered "yes" to between five and eight questions then it is likely you have experienced disability discrimination. Review your answers to determine if your experiences all fall into one category, such as employment or education, and/or one type of discrimination, such as indirect or direct. When you have a better picture of where and how you believe disability discrimination is present in your life you can make a more informed plan of how to confront it and hopefully resolve it. If you need advice or support, see if there is a human resources or disability support officer available, or a disability rights group such as DIAL UK which might be able to help. If you answered "yes" to nine or more questions then it is very likely you have experienced disability discrimination. If possible, write down as many details as you can about each instance to help clarify the events in your mind. Use established complaint procedures to report each incident, but be aware that you may not find satisfaction on each count or from each separate authority. Taking a case to tribunal may remain an option, though you'll want to weigh up the time, energy and cost of such an action before making any firm decisions. You can obtain further information on disability discrimination from the Equality and Human Rights Commission (England, Scotland, Wales), the Equality Commission of Northern Ireland, Directgov (England and Wales) and/or Nidirect (Northern Ireland).